EnvyPak, Marysville, Ohio, recently announced an innovative, patent-pending, clear plastic envelope format that can reduce postage for marketers by as much as 57 percent. EnvyPak recently received a monumental ruling from the United States Postal Service specific to this new clear envelope that utilizes EnvyPak's proprietary manufacturing technology. "This is a big deal. Many clients will see hundreds of thousands of dollars in annual postal savings," shared Sean Bannon, business development manager for EnvyPak. "Demand for clear envelopes with a high-end look and feel has grown significantly over the past several years. Until now, marketers have only had one option—to pay higher postage versus less impactful traditional alternatives." Working closely with the Pricing and Classifications Division, EnvyPak has spent more than 10 years developing a clear envelope that meets USPS automation specifications. With this recent ruling, EnvyPak can now offer a solution that enables the processing of unique direct mail more efficiently, thereby reducing postage costs. "They have done a great job of promoting direct mail innovations through their "Irresistible Mail" initiative and to my knowledge, this is the first and only plastic envelope to gain approval from the USPS," said Bannon. America's most prestigious brands will continue to look to EnvyPak for high-impact, innovative direct mail solutions that rise above mailbox clutter and drive return on investment. The new format reduces mailing costs, which will result in even higher ROI. At the same time, it opens doors for marketers who before found higher postage to be a significant challenge. EnvyPak's Automated Letter Rate format is available with print. Envelope graphics can interact with contents for striking, one-of-a-kind direct mail. "Printed EnvyPak envelopes interact with insert graphics, create dimensional effects, award-winning optical illusions or hide special offers and specific content to create intrigue,” noted Bannon. 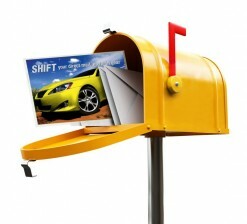 “High-impact, interactive direct mail acquisition campaigns drive response. We are excited that the recent USPS ruling will allow our clients to utilize interactive print concepts that only EnvyPak can offer." For more information, visit www.envypak.com.